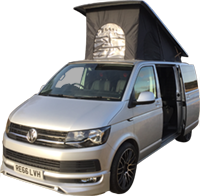 Deeside Classic Campers Testimonials – What our customers say. We hired Fergus for a four day adventure to Skye and had the best fun ever! 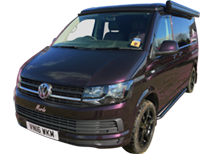 What a great way to camp in style and see Scotland in a different way. We didn't stop smiling from the time we picked him up until we dropped him off and will carry fond memories of the trip and all of Fergus' wee quirks for a long long time! Would highly recommend Deeside Classic Campers to anyone with a love of road tripping, the great outdoors. Not to mention the great service we received from Claire and the team. My mum organised Angus as a surprise for our wedding and it was officially the best surprise ever! My flower girl jumped in with us on the way to church and hasn't stopped talking about it. Cannot recommend highly enough! The service from Claire was exceptional in the run up to the wedding! Had the most amazing honeymoon with Hamish last week! We ventured all over Skye with him and he coped brilliantly! I couldn't speak highly enough of Claire and Martin and the rest of the team for all their help and advice, their route to Skye advice was brilliant and we just loved every minute of it. We had grown very fond of Hamish by the end of the week, it was quite difficult to part with him! Would highly recommend to anyone! I absolutely loved travelling to my wedding venue in Angus. He was perfect for our day, and totally immaculate. Some of our best photos are in or beside him! Claire was always so friendly and helpful. Our chauffeur was relaxed but professional and really lovely. He made my husband and I feel very special, making sure we took time to have our champagne drive together-which turned out to be a very memorable and special part of our day. We hired Fergus for a weekend in early June and can't rate Claire and her team highly enough! The van was beautifully equipped and the whole customer experience second to none. Can't wait to do it all again! We had Hamish as our wedding day camper. Claire was our driver and she was prompt, courteous and very professional. She kept an eye on timings and made sure the morning was seamless. I can't recommend Deeside Classic Campers enough for wedding transportation. Just home from a weekend away in Murdo. What a fab van, very well equipped with everything you need. Claire's attention to detail & customer service are fantastic. She explained everything thoroughly before we drove away, and offered for us to call at anytime if we had any questions. We thoroughly recommend DCC & look forward to hiring Murdo again. Thanks again for a great experience.